Stuck on a problem on cubes and cuboid? Yea, it’s pretty difficult to imagine something in 3D and draw it in 2D on a paper and solve numerical on it, moreover. Here are to your rescue .. some hints that will help you get the solution. A cube is a structure which is equal in height length and width. For example, A sugar cube ,or a cheese cube . A little modified version of a Cube is Parallelepiped or Cuboid in which not all 3 dimensions are equal. We know cube is three dimensional. So has 6 sides, hence a die has 6 numbers or if we put it the other way round, 6 sides of a cube is the reason why most of the dice are cuboidal in shape. A cube has 8 corners. Area of sheet of cardboard required to make a cube can be calculated as number of faces multiplied by area of each face. The amount of water you can hold in the cuboidal tank is determined by calculating its volume given by S*S*S cubic units. When you cut the cube by M number of lines on each side, you will have the cube divided in N smaller cubes on each edge, where N=M+1. For instance, say our cube has an edge of 5cm.If I cut it with 4 equidistant lines; each edge will be divided in 5 equal smaller parts, with an edge of 1cm each. 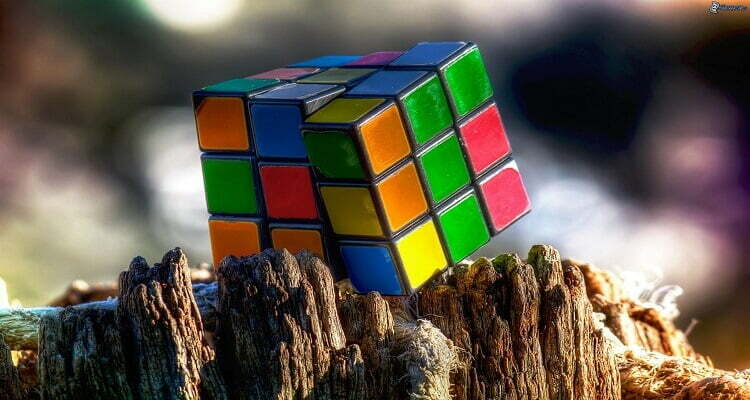 Remember the volume will remain same even after cutting the cube. When the cube is painted with same colour on all faces, then total painted area is equal to number of faces painted multiplied by area of each face. Consider any one face. When we remove the pieces on margin, what remains will be those pieces that have only one side painted. For one face, we will have (n-2)*(n-2) one side painted cubes. In total, there will be 6*(n-2)*(n-2) such one side painted smaller cubes. Here we would consider the contrast of the above case. The cubes with two sides painted will be common to 2 faces of larger cube. Hence we consider the pieces on margin (edges). But the corner pieces have more than two sides painted …so eliminating them …we have (n-2) such two side painted pieces. For 12 such edges, we have 12*(n-2) two-side painted pieces in total. A cube with 3 sides painted will be a part of 3 faces of the larger cube. We know that only corner pieces are common to three faces. Hence, there will be 8 such cubes having 3 sides painted. This number will be 8 for all cubes painted in same colour on all faces. As any cube will have 8 and only 8 corners. Ah, now that’s what remains. Since the cube has only 3 dimensions, we cannot have more than 3 sides painted pieces at any given point of time. These no side painted pieces will be deep inside. And we cannot see them …hence difficult to imagine. Well they are easy to calculate. One method is to calculate all the above 3 cases and subtract that from the total number of smaller cubes. Tiresome it is. Here is a shortcut formula. The number of non-painted pieces will be simply (n-2)*(n-2)*(n-2). For n=4, we have (4-2)* (4-2)* (4-2)= 8 such hidden pieces. A face diagonal measures 1.41 times the side. There can be 6*2 = 12 face diagonals for any given cube. Also there is a space diagonal which is formed by joining two opposite corners of a cube. A space diagonal measures 1.73 times the side. A cube has only two space diagonals. Hope this helps you crack the next puzzle on cube. All the best.